Tooth replacement used to mean just repairing those parts of teeth visible when you smiled. While replacing the visible portions of teeth dramatically improves your confidence and ability to chew a variety of foods, without the supportive underlying root system, your smile is still incomplete. That’s why we frequently recommend dental implant-supported tooth replacement for Sachse Family Dentistry patients. Partnering with a local specialist in oral surgery, Dr. Rottman can replace the entire lost tooth, both roots and crowns,for a natural-looking tooth replacement option. Call our team to schedule a dental implant consultation today. The dental implant process is completed in two phases. The first part of the implant-retained tooth replacement process is the surgical placement of the dental implant posts. Dr. Rottman will work with a local specialist to complete this phase of treatment. The procedure is simple. A small incision is made in the gum tissue, and the implant post is inserted into the jawbone. A protective cap is placed over the top of the implant as it heals. Over the course of three to six months, the implant post fuses with the supportive gum and alveolar bone tissue. 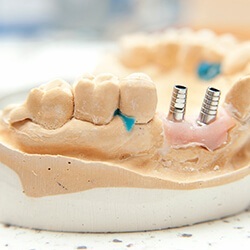 Once this fusion process is complete, you’ll return to Sachse Family Dentistry where Dr. Rottman will attach a custom crafted dental crown or fixed bridge. 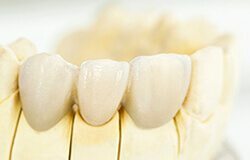 Typically one or two dental crowns can be supported by a single implant. For three or four tooth bridges, two implants will be needed — one to support each end of the bridge.